1937 was an exciting year for me, planning as I was my first ballet. I had often thought, in the years before the First World War, when I first saw the splendour of the Diaghilev ballets, how glorious it would be to have one’s own music created anew in the dance; and now the chance had come to write a work to be given at a gala performance by the Sadler’s Wells Ballet [as it was then called] in their first season in Paris the following year. I knew exactly what subject I wanted for my dramatic ballet—the game of chess. This had always fascinated me, though I knew I could never be anything but an average player … I had as collaborators Ninette de Valois for the choreography and McKnight Kauffer for the costumes and decor. Ninette de Valois, who had danced in the Diaghilev Ballet, was that rare fusion, both artist and organiser, … McKnight Kauffer at this date was chiefly known for his striking poster decorations, but there is no doubt that his early death robbed the theatre of an outstanding designer. Neither knew anything about the game of chess, and so I held sessions in my Hampstead home, during which I moved the pieces about on a big chessboard and demonstrated their characteristic moves—the knight’s jump, the bishop’s diagonals, the queen’s mobility, the king’s tottering shuffle, etc. I wrote my own scenario, and in this I had expert advice of W Bridges Adams. My wife and I had first met him in the years following our marriage, when we saw his lively production of The Merry Wives of Windsor in the old theatre at Stratford. After giving up his directorship of the Shakespeare Company there, he joined the Drama Department of the British Council … There was little about the history of the theatre that he did not know, and from his fund of experience he gave me one specially useful tip. It was this: if you are going to play about with an exact intellectual conception like chess, woo your audience with a bit of realism first, and then they will accept your romantic departures from the expected. So, early in the ballet the pieces appear one after another on the gigantic board, and at one precise moment line up in the exact position for starting the game. I like my colours to be brilliant, and with the opposing sets of pieces clothed in red and gold, and black and silver, I certainly got my wish. There were long discussions about the nature of the two players in the game. At first I wanted them shown as huge shadows over the board, but it was eventually decided to have them in the flesh as actors to open the drama. They could be costumed to depict Night and Day, or Alpha and Omega, or Black and White, or any other obvious contrast. Finally, we chose Love and Death, and here again my first idea was that, though Death wins the game, Love should be seen setting up another row of pieces, demonstrating that Death’s win is no final one. It was a joy to me to see this my first ballet take shape, with the wonderful cast assembled, among them Frederick Ashton as Death, Harold Turner and William Chappell as the Red Knights, Michael Somes as a Black Knight, Robert Helpmann as the old Red King, and Margot Fonteyn leading the Black Pawns. In the first performances the main role, the Black Queen, was danced by June Brae. Bliss denied any direct or conscious influence, but something of the fraught atmosphere of the times must have entered the music which, like the game, has a ruthless quality, no quarter asked or given. There may be some trace of Prokofiev (he too was a chess-player and Bliss would probably have known his Diaghilev ballets Le Pas d’Acier and The Prodigal Son) but if so it’s well absorbed. 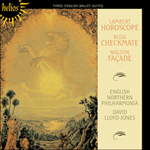 In fact for all its alert, incisive rhythms (a Bliss fingerprint), its harsh brilliance of scoring and its discernibly romantic underpull, the shape and substance of the music is quite classical, and the connection between the dedicatee (R O Morris, composer, teacher, renowned contrapuntist, and chess-player) and the steely contrapuntal mise-en-scene of the ‘Prologue’ cannot be coincidence. The ‘Prologue and Five Dances’ represent approximately half of the complete score, which lasts for about fifty minutes. Prologue: The Players: The two players sit motionless on a raised dais with a chessboard between them. The armour of the one is golden, of the other black. The Golden player slowly removes his vizor, disclosing the features of Love, the Black player slowly strips his gauntlet, disclosing the skeleton arm of Death. They turn the chessboard three times for move. Love wins; lights dim; curtain up. Dance of the Four Knights: The two Red and two Black Knights leap on the board and dance, ‘Allegro moderato, sempre robustamente’. The Reds challenge the Blacks to a display of daring; Red Knight I surpasses them all. The Red Pawns applaud their Knights and start dancing with them. At the end the four Knights make their challenging gestures simultaneously. Entry of the Black Queen: The most dangerous piece on the board. The Black Knights fall on their knees, the Red Knights and Pawns remain spellbound—so much so that Red Knight 1 follows her across the board as if hypnotised. She throws him a rose, and leaves the stage. The Red Knight’s Mazurka: An exuberant solo dance for Red Knight 1. Ceremony of the Red Bishops: The two Red Bishops enter, each escorted by a Pawn. The latter raise their banners and slowly dip them, so as to give the stage the appearance of a chapel. The Bishops bless the kneeling Knights. Finale: Checkmate: The final onslaught of the Black forces begins; black pieces appear on every side, the Pawns holding long lances. The Red King, irresolute and terrified, is forced gradually back until he stands on the steps of his throne, a ring of enemies surrounding him. Then, at the moment of death, he has a vision of himself as a young and strong ruler. He draws himself up to his full height … the Black pieces waver … but the Black Queen enters from behind the throne and stabs him with a spear. He lifts the crown from his head and falls headlong in the circle of enemy lances and swords.